What a week! First I was on the Leonard Lopate Show. Then it was Poles without pants. After that I discovered the CRACK PROS. And last— but not least, I finally got a photo of Greenpoint’s very own Jeep-riding Doginator. How can I possibly keep up this kind of momentum? Well, after several long thankless hours I found a tale from Greenpoint’s past that is in keeping with this especially magical week here in the Garden Spot. See the big thing those police officers are attempting to move? 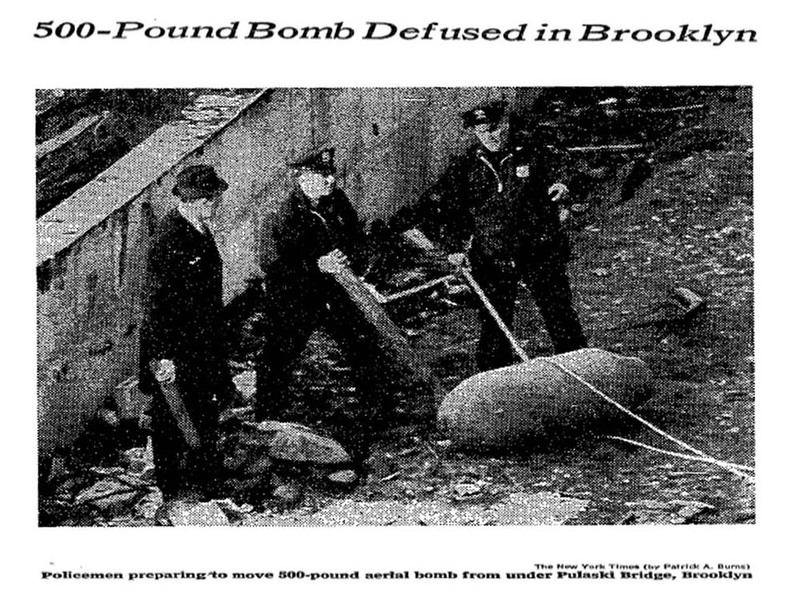 That’s a 500 pound World War II bomb. Where was this bomb located? Under the Pulaski Bridge. Why was it there ? Because Greenpoint is a very special place. From the December 4, 1969 edition of the New York Times, I present to you a cautionary tale of what happens what Greenpointers will do with a couple of (yes, TWO) bombs. Enjoy! The above statement is why they’ll have to drag me out of this neighborhood kicking and screaming. God I love Greenpoint! 3 Comments on Greenpoint is the Bomb! How times have changed. Now if a kid plays with a 500-lb WWII bomb his parents would make him wear a helmet. Correction: his NANNIE would make him wear a helmet. I want one of these bad boys for my front yard. I do not have a front yard, but that is immaterial. Give it a nice paint job, flank it with a couple garden gnomes or toilets (employed as planters) and there have you. Greenpoint at its very Greenpointiest. Betcha no one in Park Slope has (or had) a bomb in their front yard. Wimps. park slope had a freakin plane land on it.